A full body massage is combined with our Hydra Source Marine Facial. A performance facial to replenish all skins. 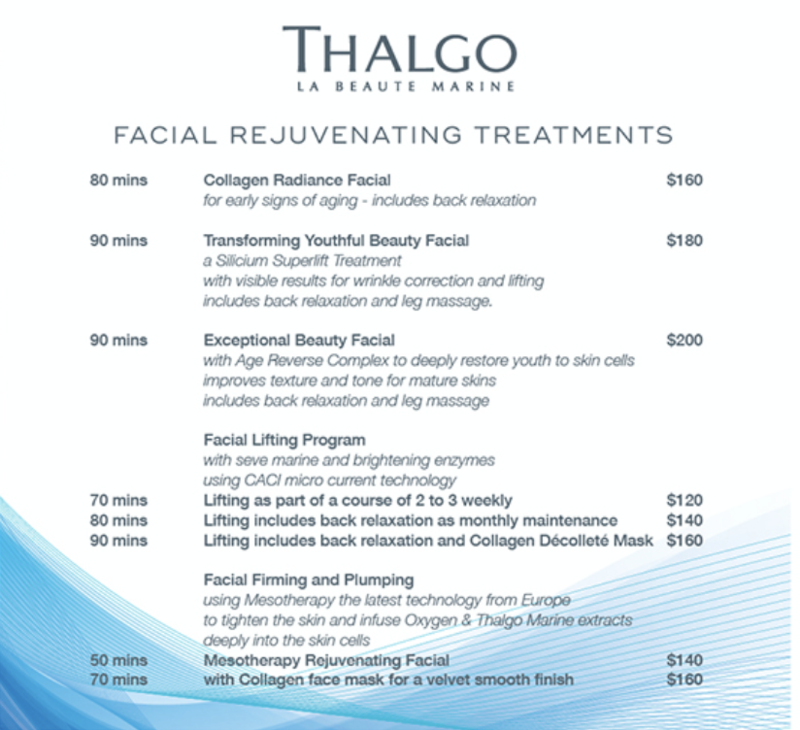 This is our Signature Treatment to introduce you to Thalgo marine care. If your life is full and you need to relax this is the perfect choice. This Full Body Massage with your choice of Lemongrass oil to uplift or Lavender oil to calm will help to unwind your tension knots and smooth stress away. It is combined with a balancing and replenishing Facial Treatment to leave you feeling fresh and renewed. We intend to thoroughly pamper you. 80 mins of Body Massage with a skin smoothing Native Marine Collagen Facial Treatment to offer softness and luminosity. 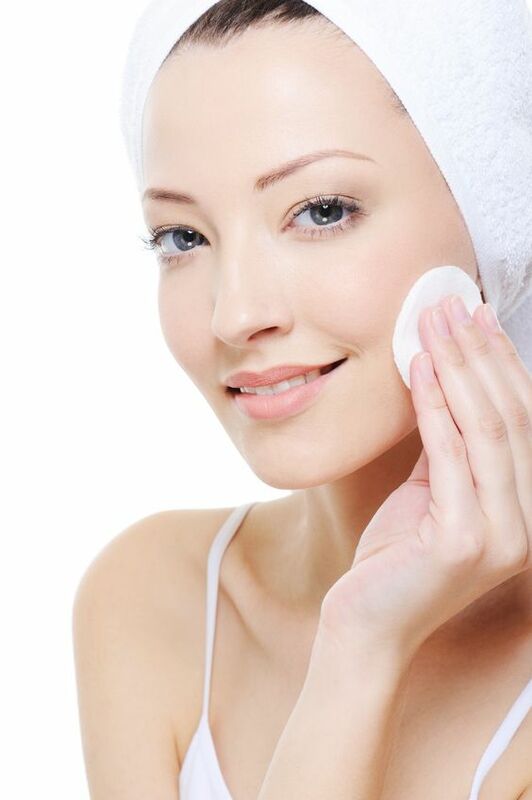 Sensitive skins are comforted and first signs of wrinkles reduced. 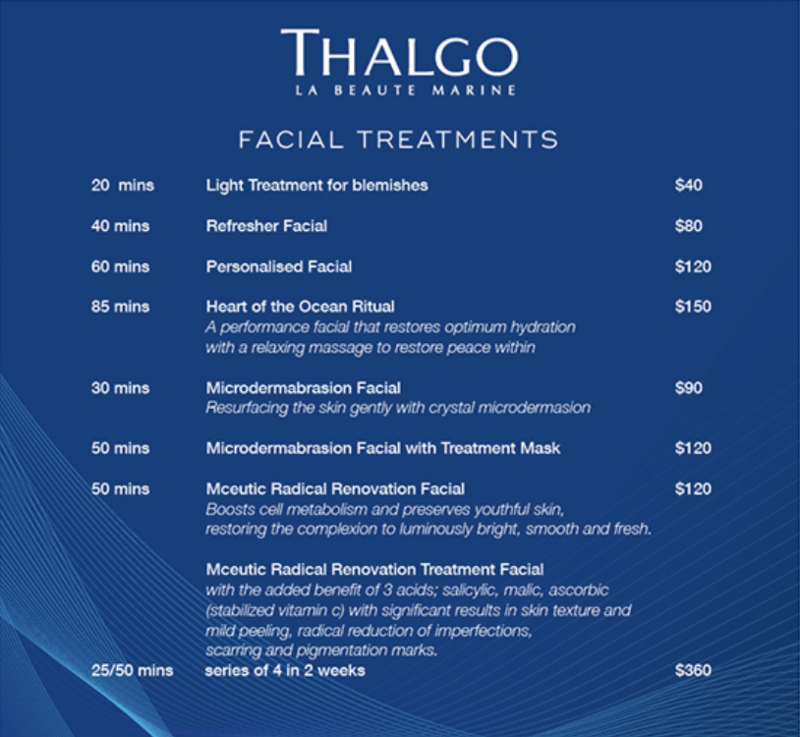 A thorough cleanse and exfoliation (extraction if needed) will be followed by a digital pressure and lymphatic drainage massage of the face using Thalgo marine to replenish completed with a treatment mask to balance your skin. 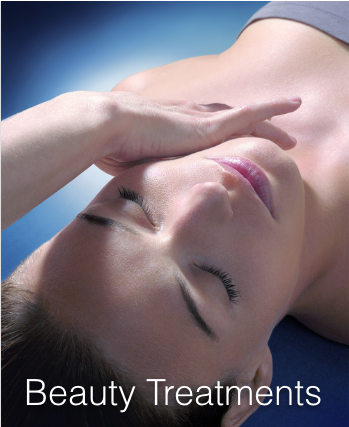 Our Therapists will recommend the best homecare to keep your skin looking good. A Personal Facial is ideal for Season change of products. After a thorough cleanse and exfoliation we will apply an infusion of marine radiance boosting concentrate using a digital pressure and lymphatic drainage massage to relieve tension from your face and completed with your favorite Thalgo moisturizer wakeup your skin. This Refreshing Facial is ideal before a Party! 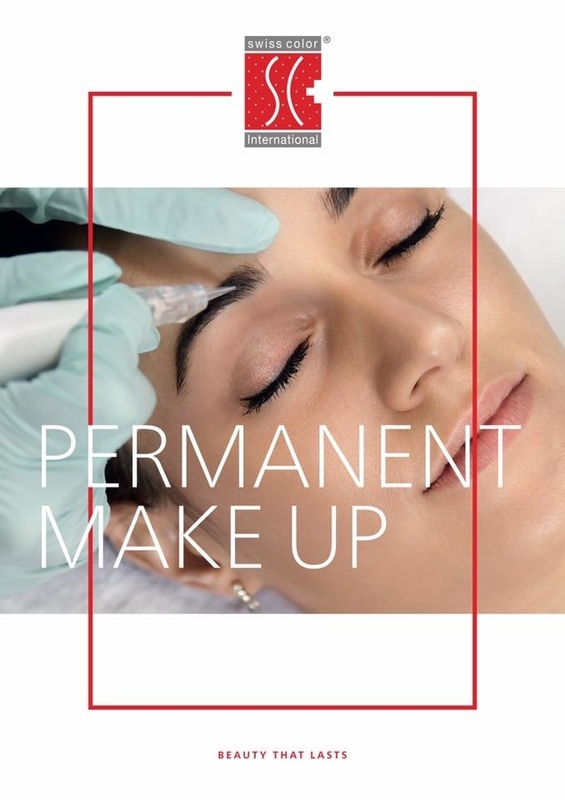 A series of gentle peeling facials for pigment and resurfacing combine 3 effective acids and an active oxygen and pure mesolift marine concentrate to boost cells metabolism and personalized to regulate and resurface the skin. This will not aggravate or cause intense deep peeling but is very gentle. This 'Red Carpet' Treatment starts with back relaxation. The face is resurfaced with crystal microdermabrasion to brighten and renew the complexion and then Lifted with C.A.C.I. 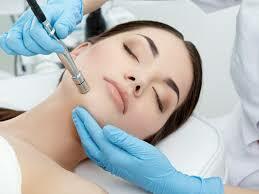 micro current technology using gentle acids to plump and replenish skin cells. A hyaluronic mask leaves the skin with a juicy glow and noticeable correction of skin includes tighter pores with a smooth, more even tone and contour lift. We use CACI microcurrent technology to lift the muscles and contours of the face and stimulate the skin cells preserving youth. CACI will also tighten the pores as skin cells are awakened, we use rejuvenating and brightening serums which are carried deeply into the skin. 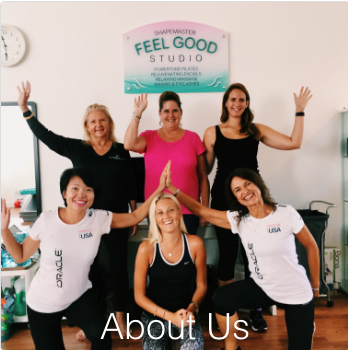 The treatment is subsensory meaning that you will not experience any pain. It is also natural and subtle in effect. 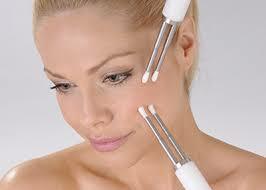 Clients who continue with CACI will age kindly as the skin cells will regenerate and firmness will be maintained. to purify with Purity Reviver for a deep rebalancing cleanse with the ideal combination of zinc and salicylic acid developed to work in synergy with both sound vibrations and sequential ultrasound. 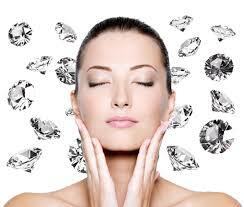 diamond microdermabrasion restores the skin to smooth. A marine purifying mask refreshes and rebalances. 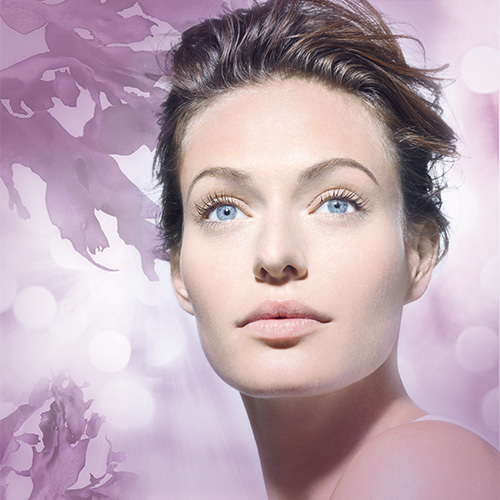 The skin is healthier, brighter and cleansed of impurities from the first session. after purifying the skin with purity reviver and smoothing with diamond microdermabrasion, hydrating ‘seve marine bleue' from the ocean is pushed deep into the skin using draining, infusing and stimulating motions with ultrasonic technology. An ultra hydra-marine mask optimises hydration within skin cells. The skin is fresh, bright and intensely hydrated from the first session. This anti aging Facial treatment uses oriental massage to drain and lift the face with 64 marine nutrients. This is an award winning Youthful Treatment. 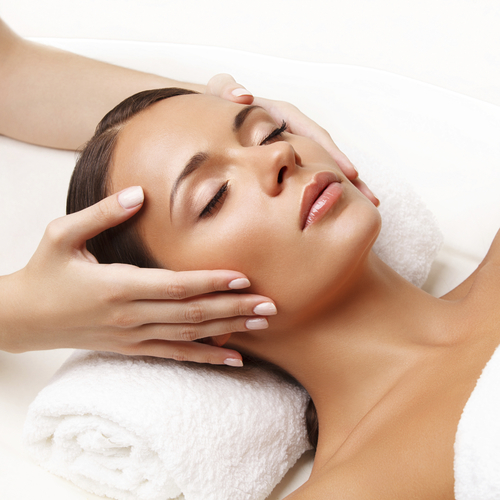 Enjoy as a Facial with Scalp Massage or indulge with a Face and Body Ritual. 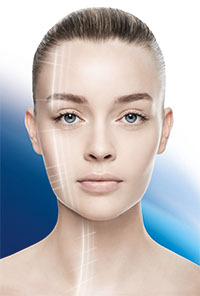 This uplifting Facial Treatment with Marine Silicium and Hyaluronic Acid Complex works with a double Cryo-Sculpting Mask to fill deeper wrinkles and for intense re-firming and restructuring of the connective tissues. After just 1 treatment your face will glow and your skin will be replenished with renewed youth from the rich and highly concentrate serums. 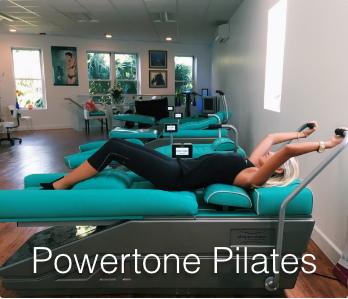 This is recommended for those over 50 for lifting and plumping deeper lines. A full body massage accompanies the treatment to make you feel thoroughly pampered. This uplifting and Award Winning Facial Treatment with Age Reversal Complex which reactivates the original dermo lifting power of fibroblasts will brighten and soften even a dull complexion with silky results for an age defying experience which redefines facial contours and begins with crystal microdermabrasion and the silkiest seaweed mask with our exceptional ultim product range. A full body massage accompanies the treatment so you will feel thoroughly pampered and experience serenity. Our ultimate treatment to restore youth. 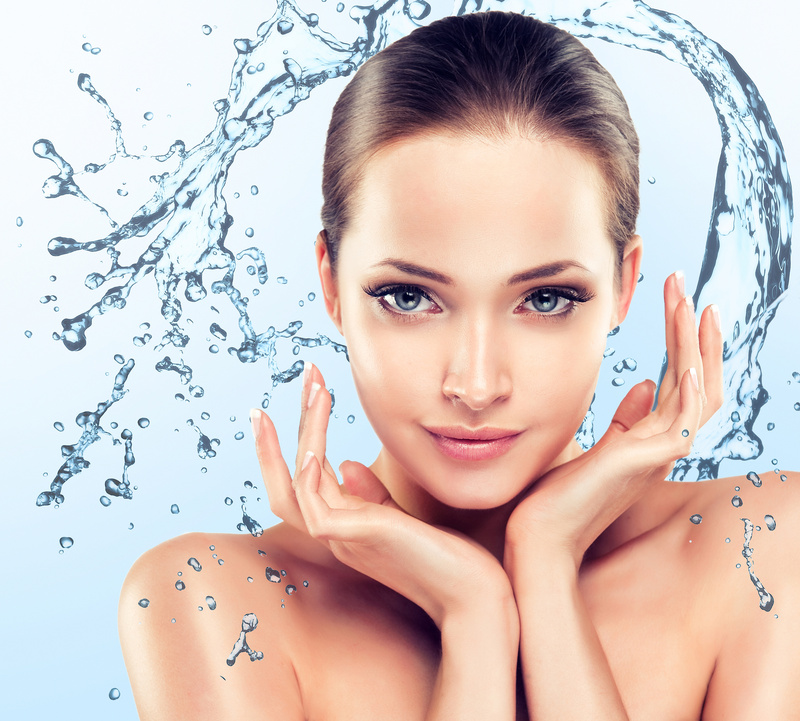 Cell rejuvenating serums and Hyaluronic plumping products are used to recharge the skin cells and reduce expression lines and diminish scars. 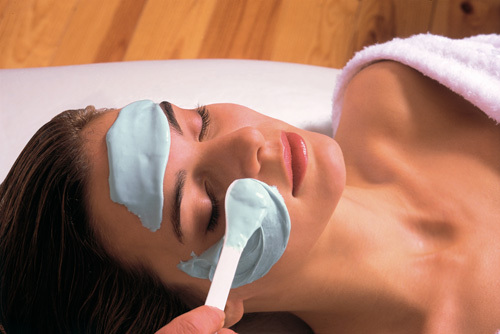 A hydrating and soothing mask is applied after gentle needling using our Swiss machine. A few days later the skin recovers and collagen in the skin is optimized. We use Swiss Color which is a high quality machine with a wide variety of colors which are safe and without lead oxide! Our Makeup Artists are highly trained to accurately measure and define your features. Brows are naturally filled in with the latest ombre technique from Europe. We select the color according to your own eyes and hair. Eyebrows should be refreshed every 12 to 18 months. The process will take 2 treatments as we wish to perfect shape and color. We have a variety of colors to define your eye color.